Born: 1759 and died 1825. Son of: Thomas Forby and Susan Forby nee Harvey (1732-1824). 2. Susan Webb nee Forby who married Capt Webb. 3. Mary Millers nee Forby (17? ?-1845) who married Rev George Millers. 1. The Diary of his niece Eliazabeth Jones (nee Helsham). 2. The book 'Stoke Ferry' by Doris Coates, published 1980 (see below). 4. The book 'A General View of the Agriculture of Norfolk' by Arthur Young. 5. The book 'Forty Norfolk Essays' by Robert Ketton-Cremer. 6. An entry in the Dictionary of National Biography. 7. A recent article written by Stewart Waterston (see below) for the Parson Woodforde Society. The following note is taken from the book "Stoke Ferry" by Doris Coates, published 1980. Robert Forby, who was born at Stoke Ferry in 1759, is thought to have been the grandson of Jane Forby, who left land in Wretton for a charity in 1711. He was educated at King's Lynn, where George Manby, the inventor of the rocket for life-saving at sea, was a fellow pupil. He then graduated at Caius College, Cambridge, where he became a fellow. He left Cambridge and moved to Barton Bendish with his mother and sisters and became tutor to the sons of Sir John Berney. When the Berneys lost a considerable amount of money, they dispensed with his services. He then took in pupils at his home to earn money to support himself and his relatives. As the number of his pupils increased, he moved his private school to a bigger house in Wereham (probably the Hall). In 1801, his finacial affairs became more secure when he was appointed Vicar to the rich living at Fincham. He was very active in public affairs, holding positions of Justice of the Peace, Deputy Lieutenant of Norfolk and Commissioner of the Land Tax. But he had other, more academic, interests. He was a keen botanist and spent much time studying the flora of Shouldham Common. His claim to fame lies in his one published book on the vocabulary of East Anglia. Its title was "An Attempt to Record the Vulgar Tongue of the Sister Counties of Norfolk and Suffolk as it existed in the last Twenty Years of the Eighteeth Century". He was afraid that dialext words would disappear as local craftsman and labourers were enabled to acquire education at the Mechanics' Institues then being established. Unfortunately, he died suddenly in 1825 before his book was quite finished. It was completed by his friend, the Rev George Turner an published in 1830. 1787-1799 Joseph Forby MA (Son of Joseph Forby). 1799-1825 Robert Forby MA (Nephew of Joseph Forby). Many members of the Society will be familiar with the name of Robert Forby as his work, 'The Vocabulary of East Anglia', has been quoted in correspondence and articles in the Journal and in notes to the Diary transcript. 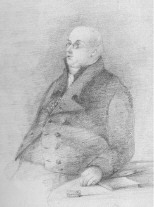 He was Rector of Fincham in the Diocese of Norwich from 1799 to 1825. Previous to this he held the living of Horningtoft, a small village near Fakenham. I became interested in his life after moving to his former Rectory in Fincham. A few pieces of information on Forby's life have been forthcoming, with one or two links to JW, and, they being for some years contemporary Rectors in the same Diocese, some of the information I have on him may be of interest. Robert Forby succeeded his uncle, Joseph Forby, to the living of Fincham, and in following up references to the Forby name I came across lengthy references to Joseph in Arthur Young's book 'A General View of the Agriculture of the County of Norfolk'. Bearing in mind the close involvement a rural Rector had with the land, and its productivity, especially the Glebe lands, some of the entries concerning Joseph make interesting reading. Young continues with a detailed account of Joseph's husbandry. At a later date Joseph communicates to Young the claim that 'he had never seen any piece of land at Fincham planted part with cabbages and part with turnips, where the former did not exceed the latter four-fold at least.' He gives details of an experiment he did to see if claims that cabbages impoverished the land had any basis. He rotated cabbages, oats and wheat on a piece of 'middling land' and found that no person in the Parish had cleaner oats or wheat, nor any such large crop. At some point in time Joseph discovered a fine basket osier which was named Salix Forbyana. Sir James claimed that this was in honour of Robert, as well as Joseph, Forby. Clearly Joseph Forby was a Rector who took his farming seriously. At a time when there was a good deal of innovation and careful thought put into farming he was not content to live off his tithes alone but desired to improve the husbandry of his own land. Joseph Forby died on April 25th1799. He was followed as Rector of the living of Fincham by Robert Forby, his nephew. We know something of his life from a memoir, written by Dawson Turner, as an introduction to his book; Forby having died before publication. One of these pupils was Dawson Turner and so began the lifelong friendship between the two .Turner acknowledges the contribution Forby made to his lifelong love of botany. Apart from his book on East Anglian vocabulary, Forby left a few written records. One of them, according to Turner was 'A Sermon preached in the parish church of St. Peter at Mancroft in the city of Norwich, on Good Friday, April 14,1797, for the benefit of the Charity Schools in that city.' One wonders if he, like JW, was called on to take his turn at giving sermons at events such as this. JW , of course knew this church well. Here amongst the guests was 'Mr Windham' about whose electioneering and political career JW was to record comments several times over the years. A surviving fragment from Robert Forby's pen is the following epigram which appeared when William Windham was standing as MP for Norfolk, having had a reputation as a politician who was not always constant in his thoughts and views. And then change, if they please, like the weather. Another surviving piece of his writing is a letter he wrote to J.W. 's friend of many years, Henry Bathurst, when he was Bishop of Norwich. The reply it induced also survives. The 'venomed shaft' of the letter from the Bishop's man ends with a fine example of the caustic. Forby's successor at Fincham, the Rev. William Blyth, writing in 1863, says that he was 'especially remembered by his surviving parishioners' and 'was a man of letters, strong mind and brusque manners, a ''clergyman of the old school''. 'Sir Michael Bedingfield was then residing at Oxburgh Hall and, notwithstanding the staunch Romanishe, Lady B. and my mother were great friends. The then Rector of Oxburgh Hall was the Rev. Joshua White whose wife and daughter were very superior people, good and clever, the elder lady rather awful and the younger very lovable, as Mr. Forby found. Indeed they were mutually attached, but their views of duty to their respective parents led them to relinquish all thoughts of marriage.' Was this true or was the real barrier an Anglican clergyman marrying into an eminent Catholic family! We know from the memoirs in his book that Robert died on December 20th 1825. 'Mr Waddington called upon our good friend, Mr. Forby, about one o'clock, while he was taking his bath, as usual. After waiting a considerable period the family became alarmed; and upon opening the door, they found he had fainted in the water, and had been suffocated, and had evidently been dead some time. 'It was in the week before Christmas that I received the intelligence that our beloved parental friend had expired in his bath the previous noon, sinking beneath the water either from fainting or a fit . . . Before Christmas Day we had placed him beneath that very spot whence he had, with a solemnity noticed by many, in the words of the second warning bade his parishioners to the celebration of the Holy Communion on the coming festival. From Elizabeth's writings Robert emerges not as a fairly isolated bachelor living alone with his ever aging mother in a large house but as a man, not only having a sister living all the time with him, but having an extended family of in-laws and young relations on whom he lavished much care and hospitality and who was remembered so fondly for his kindnesses decades later. His regular summer and Christmas family gatherings at his house would no doubt have been envied by JW who was so far from his roots. 'Modern philologists may smile at some of Forby's derivations, and his Vocabulary certainly presents a contrast to the businesslike compilations which embody the results of their learning and research. But the amplitude of Forby's methods, the digressions and speculations and anecdotes in which he constantly indulged, give his book a leisurely charm which is lacking in more recent and more efficient works of etymology. I have found three portraits of Robert Forby. A painting is held in the Castle Museum, Norwich, painted in 1802, artist unknown. There is the lithograph in his book, done in 1822 and a sketch from life in Elizabeth Helsham's book. All show a kindly face, I think. Robert, Joseph and seven other members of the Forby family have their memorials within the altar rails of Fincham Church. Arthur Young, General View of the Agriculture of the County of Norfolk David & Charles reprint 1969. Reminiscences of Elizabeth Jones (nee Helsham) published privately by her Great Great Great Grandson, J.J.Heath-Caldwell. JOHN FORBY (their youngest son) died March 4th, 1745. JOSEPH FORBY M.A. died April 25th, 1799, aged 64. CONSTANCE (his wife), died March 16th, 1789, aged 57. SUSAN FORBY relict of Thomas Forby, of Stoke Ferry, died May 1st, 1824, aged 92. ROBERT FORBY (their son) M.A. died Dec 20th 1825, aged 66. MARTHA FORBY (their daughter) died Nov 10th. 1828, aged 67. ANN HELSHAM, died July 12th 1822, aged 23.